Procedures typically performed in conjunction with a facelift are brow lift, to correct a sagging or deeply furrowed brow, and eyelid surgery to rejuvenate aging eyes. Minimally invasive laser procedures such as skin resurfacing, skin brightening, sun spot removal, and RFAL Facetite (radio frequency assisted lipolysis) complement facelift surgery for an overall rejuvenated look. A facelift can only be performed surgically; non-surgical rejuvenation treatments cannot achieve the same results, but may help delay the time at which a facelift becomes appropriate and complement the results of surgery. Facelift surgery is a highly individualized procedure and you should do it for yourself, not to fulfill someone else’s desires to try to fit any sort of ideal image. Life-long sun protection will help to maintain your rejuvenated appearance by minimizing photo-aging or sun damage. In addition, a healthy lifestyle will also help extend the results of your rejuvenated, more youthful appearance. This includes reducing tobacco use or stopping altogether. 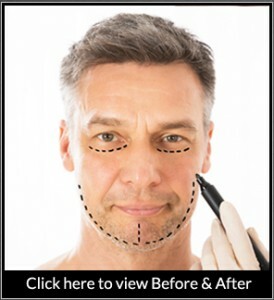 Men and women with signs of aging in the face such as jowls, deep marionette lines, and sagging necks now have an alternative to a facelift: the MACS-lift. Developed in 2002, the MACS-lift, short for “Minimal Access Cranial Suspension,” involves lifting muscle and tissue vertically and fixing them in a more youthful position with dissolvable sutures before gently redraping the skin over them. This is different than pulling the skin horizontally (toward the ears) and trimming it, as is done in a traditional facelift. The MACS-lift not only provides a more natural post-surgical look than that of a facelift, it is also less invasive, takes less time to perform, can be performed under local anesthesia, and offers patients a shorter recovery period. To learn more about our less invasive MACS-lift or traditional facelift, please contact us at 310-853-5147.